Unconventional bathroom mirror shapes are a quick and effective way to make your bathroom look unique and attractive. This works particularly well for traditional bathrooms because many vintage styles have intricate designs and interesting shapes. An unconventional mirror can act like a statement piece. This makes it a perfect choice for small bathrooms, where space is at a premium. If you have two sinks next to each other, you should have mirrors to match. Hang an identical mirror over each sink to add symmetry to your bathroom. This is also a good idea if you have a long single-sink vanity that can fit multiple mirrors over it. 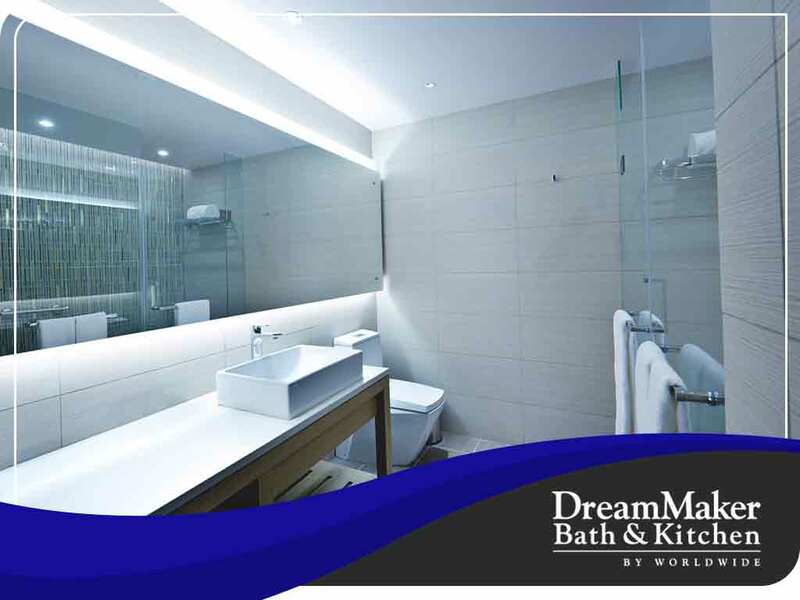 As a bath remodeling expert, DreamMaker Kitchen and Bath of Greater Grand Rapids recommends doing this because mirrors can make a bathroom feel larger and more relaxing. They also act as decor. Adding backlighting to your mirror will take it to the next level. The light will make the mirror look more glamorous and make the rest of the bathroom feel luxurious. In addition, the backlighting also makes applying makeup easier and allows you to look at your face in a detailed and flattering way. Your choice in lighting type is crucial if you choose to do this. You must use soft lighting for best results. You can rely on DreamMaker Kitchen and Bath of Greater Grand Rapids for your exterior remodeling projects and interior remodeling projects. We have won several awards from Houzz, Angie’s List and the National Association of the Remodeling Industry. We make customer satisfaction a top priority. Call us at (616) 200-7495 to learn more about our services and products. We serve homeowners in Ada, MI, and nearby areas.